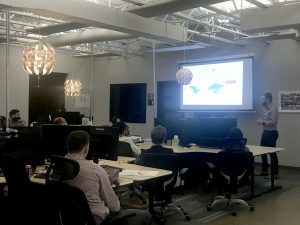 Infoverity hosted the The Central Ohio Data Management Meetup this week at its headquarters in Dublin, OH. The event featured an interactive discussion among members on topics related to Data Governance, Analytics and Machine Learning. Throughout the year, Central Ohio Data Management group addresses topics associated with building an effective data governance program, including, but not limited to: Workflows, Performance Tuning, Product Information Management (PIM), Master Data Management (MDM), SDLC, Data Quality, Data Analytics, Leveraging API’s for Data Clean Up, and much more. To join the Central Ohio Data Management Group and to receive notifications re: the next local meeting date and time, click HERE to register. Founded in 2011, Infoverity is a leading systems integrator and global provider of Master Data Management (MDM), Product Information Management (PIM) strategy and implementation, data governance and analytics, managed services and hosting solutions that help large enterprises in the retail, consumer goods, manufacturing, financial and healthcare sectors to simplify and maximize the value of their information. Infoverity is on the Inc. 5000, and is recognized by IDG’s Computerworld as one of the Best Places to Work in IT, as a Wonderful Workplace for Young Professionals and as a Best Place to Work by Business First. Infoverity’s global headquarters is in Dublin, Ohio, the EMEA headquarters is in Valencia, Spain and additional offices are located in the United Kingdom, France, Germany and Russia. In January 2019, Infoverity became 100% Employee-Owned Through an Employee Stock Ownership (ESOP) Plan. For more information on Infoverity solutions, visit Infoverity.com, follow @Infoverity on Twitter, or contact us today.